Isaac was certainly right when he wrote yesterday about the reality of fear when it comes to the issue of diversity. And he was also right when he indicated its cause: resource scarcity. If we conceive of change of this or any other nature as a zero-sum game, and we also know how much we are struggling even under the current system, we are fearful. Those of us who were at the convening at the Arena heard several stories about, for example, how the Board wasn't committed to increased diversity because it might have a negative impact on an already-strained budget, might alienate the existing audience with no guarantee that they would be replaced by another audience, and so forth. Fear is a powerful force that carves the path of least resistance that all of us prefer to travel. Inevitably, someone will make a comment somewhere that it is easy for me to make these suggestions from my privileged position as a tenured profession, and they are right. I DO think the lottery system could and probably should be applied to the hiring of faculty, however if it had been instituted when I was on the job market, I would have objected because I would have feared a loss of control. It was what was at the base of Allan Bakke's Supreme Court case about affirmative action at the University of California-Davis Medical School in 1978. Bakke felt that he had better credentials to be admitted at UC-Davis than those being admitted according to Affirmative Action decisions, and that this was unjust. The Supreme Court ruled that UC-Davis had the right to consider race as a factor in the same way they considered geography or extracurrciular activities. But for many a white male, that idea has the effect of raising the bar that was already very high. Most people want things to change for the better. We think that a more diverse set of stories ought to be told by a more diverse set of artists in a more diverse set of places. There are no Bull Connor's in the theatre. Our hearts are in the right place. But we are afraid. That is why the riverbed has to change. We can't wait for individuals who have the courage to take action to somehow achieve critical mass and single-handedly and painlessly change the direction of the flow of the river. I remember a poignant expression of frustration at the Arena convening to the effect that, when her play was in rehearsal and she had so many other things she needed to be focused on, she shouldn't have to be focused on whether there are African-American people other than herself in the rehearsal room or the organization. She was tired of carrying the weight of change on her own already over-burdened shoulders. My idea of the play lottery was a low-cost, easily-implemented idea that would remove the onus from individuals and create a system that allowed diversity to occur without the need for enormous courage. The response has been a howl of derision based on a sense that it removed individual "choice" from the process. But I ask: what have you done with this personal choice? The theatre continues to be an upper middle-class white educated elderly art form. Without accountability, personal choice too easily follows the path of least resistance, the path of greatest safety. That is why the focus has to be on the system. The education system, the hiring system, the economic system. Desegregation in schools didn't happen until there was a law (Brown vs the Board of Education, 1954) that made segregation illegal, and even then it only happened when many courageous people such as the members of the Little Rock Nine, made people live up to that law. Another example: I personally have deep objections to the No Child Left Behind Act, but I understand why it happened: previous reports about the weakness of our schools had been ignored by those in education -- NCLB was created to have teeth: monetary teeth. Now there are threats it will be extended to higher education, and true to form, higher education is ignoring the threat of the hammer. That's why I was favored, in principle, Isaac's offhand suggestion of lawsuits against arts organizations who lack diversity: it creates a financial punishment that is bigger than the feared risk of diversifying the season. It bares teeth. But I think there is a better and less litigious way, and it also involves money. After all, most of the fear about diversity is economic -- what if we build it and They don't come? So I think a major grantmaker -- perhaps the NEA initially, to symbolically blaze the trail for other major grantmakers like, say Doris Duke -- should set a policy that they will only fund grant applications from arts organizations if they achieve a certain level of diversity in hiring, in casting, in play selection. I'd go further: they will only fund theatres who include in their mainstage season a play written in the past five years by a playwright who falls into some definition of diversity (race, gender, sexual orientation, geography, class, educational background -- the definition would be created according to the values of the funding organization), and it has to be a play that hasn't yet been produced by a Broadway or major Off-Broadway company or won any major awards (e.g., the Pulitzer). The hammer must come from without, because we don't seem to be able to effectively wield it against ourselves. We need to be "encouraged" to follow our professed values. Seth Godin wrote in Tribes, "When you fall in love with a system you lose the ability to grow." That's where we're at right now. We have ignored our faith in order to follow our religion, i.e., our institutional system. Tom Loughlin was right yesterday when he posted the clip from Northern Lights and noted "the demographics of the audience. Wouldn’t it be wonderful if theatre like this existed across the United States in communities from coast to coast?" Indeed, it would. And it would be wonderful if the plays they were watching had a connection to their culture, their place, their sense of being. But as long as we are fearful about stepping outside the system, as long as there is no negative ramifications for staying comfortably inside the box, we don't seem to be capable of doing the right thing. Several people are getting impatient. "Don't just complain about the problem" they protest, "tell us the solution. If all you can do is point at the problem, it is better to just keep it to yourself!" Or "Sure, this isn't right, but that's just the way it is and always will be!" But as I have said in the previous posts about class, the first step to a solution is for people to admit that there is a problem. A look at the comments on the posts below in relation to the "Big 7" MFA programs indicates that we're not quite there yet. There is a lot of denial about class, as there is denial about race, gender, and geography when it comes to the theatre. Everybody claims to recognize that things aren't going so well, but nobody wants to actually admit that there are multiple problems, or heaven forbid do anything different to help change the status quo. Instead, we focus on doing better marketing or using Facebook or something. But let's pretend for the moment that we all agree that we would like to see more diversity in new plays being given productions (this technique could be used in hiring as well as college admissions -- hell, you could even do it for casting). Here's the problem to be overcome: there are many, many plays being written, and a fairly small number of people reading them, and they are being asked to determine the "best" play to be produced. All of this is fraught with problems : time crunch, pressure for a play to succeed, attempts to project what an audience will like, and many more. The solution to this problem often leads to the problems I have been writing about. If you don't have time to read every play in the stack, you are more likely to read the play that Paula Vogel or Lynn Nottage recommends, or one sent by someone who went to your alma mater, because you trust them. It makes sense, of course, and I'd likely do the same thing. But it also leads to a narrowing of the "track," and a sameness of offerings. Even with blind submissions, what happens is an application of standard ideas of what a "successful" play looks like (i.e., whatever looks like what's been a hit of late). Malcolm Gladwell, in Outliers, talks about how once a certain IQ is achieved there is very little difference between those with higher IQs and those who have achieved the line. So for instance, the difference between someone with an IQ of 120 and one with 160 is minimal. There is a leveling off of impact at a certain point. What is most important, Gladwell writes, is achieving an accepted level of competence. Using this as a model, here is my suggestion for a process: literary managers for regional theatres who are tasked with finding a new play to produce read plays and separate them into two piles: those who achieve some specific level of competence (and the theatre can prepare a rubric for this -- number of characters, settings, style, etc. -- you know, guidelines), and those who don't. The latter, which are usually identifiable without reading the entire play, are discarded. The successful plays are assigned a number. The numbers are put into a jar. Any play by a playwright that has certain characteristics the theatre wants to seek out (say, African-American or international or lower-class or rural, whatever) has additional slips put into the jar. And then a lottery is held. (This is sort of like the NBA draft lottery, and also like the admissions lotteries used by many, many private and magnet schools for admitting its students.) So instead of trying to fine The Play , the readers are simply finding a group of plays with a certain level of competence (and the bar could be set very high -- it doesn't have to be minimal acceptability), weighting them according to a theatre's priorities, and then letting Chance take over. You could also include classics in the mix as well, and choose your whole season this way. If theatres did this, I'm pretty certain that the plays (or hires, or students) would likely be more diverse, and the effects of cronyism would be diminished. Yes, we'd have to give up some control, and some sense that we can actually find the Best Play Available through sheer merit, but I think we'd all agree that the track record for recognizing Good Plays is pretty low in practice anyway. It really tends to be a crap shoot, so why not use a fair set of dice rather than loaded dice? No need for sensitivity training, no need to February slots, just a jar with slips of paper. Lately, we've been talking about class and education, and its effect on theatre. First, let me say that my interest in this topic is strong, obviously, and is so because I am an educator in a theatre department who was a first-generation college grad from a working-class family. I grew up in a city of 100,000 that had the greatest amount of industry per capita of any city in the entire United States (Racine, WI). In my family, the main career question was whether you would work on the factory floor or in the office. I started out on the factory floor: I spent a couple years soldering gun barrels together at Sheridan Air Rifle. I didn't finish my undergraduate degree until I was 28 because I had to drop out for several years for financial reasons. I attended the University of Minnesota for undergrad, Illinois State University for my masters, and City University of New York Graduate Center for my doctorate - all public schools. It took me seven years to write my dissertation because I was working a full-time job as an administrator at Illinois State and researching and writing nights and weekends. I am now 51 years old, and I just paid off my student loans last year. My interest is also strong because I believe in the power of systems to shape day-to-day life. Theatre exists within a economic, social, and political systems that shape every aspect of the art. And the theatre itself is its own system, one that responds to the larger system, but also one that reflects ideology and historical decisions. I do not believe that the discipline of theatre as it currently exists came about "naturally," the inevitable and irresistible result of outside pressures. I have discussed, for instance, how our current centralized theatre system is the result of decisions made in the late 19th century by powerful people involved in the Theatrical Syndicate. A system is larger than an individual. The things I have written about the system that supports the so-called "Big 7" MFA programs, for instance, should not be seen as a slam about the individuals who graduated from those programs, who are doubtlessly talented and hard-working and deserving -- they would have to be in order to get in and, more importantly, stay in. Nor are comments I've made about the homogeneous nature of that system meant to say that every single person who attends such a program or emerges from such a program is the same, either in terms of their background or their aesthetic. When discussing a system, however, it is necessary to look at the general trend rather than individual cases. The fact that I am employed, for instance, is not a refutation of the fact that our economy is in a severe recession. The education system in the US is a system, and theatre education, undergraduate and graduate, is a part of that system. For the moment, I am going to discuss undergraduate education, because it is what I know personally, and because it is what I have data about. While graduate education is somewhat different, there are enough parallel to make this illustration useful. Let's look for a moment at Harvard. Admittedly, Harvard is not one of the Big 7 for graduate theatre education (or at least fo r graduate work in playwriting), and it would be better to have to hand data for Brown, say, or Yale. But like the majority of the Big 7, Harvard is an elite private school, and the parallels are fairly strong. What you're seeing here is the effect of privilege I discussed in a previous post: quality high school or private prep school, good teachers, abundant extra-curricular activities (because Harvard will look at that, too), likely an SAT prep course -- all adds up to a 250+ point increase on the SAT. How does this affect racial diversity? According to the Fall 2008 Harvard Fact Book, there are 20, 320 undergraduates enrolled. Of those, Asian/Pacific Islanders represent 12.8%, Black/Non-Hispanic 6.3%, Hispanic 5.2%, and a variety of other ethnicities less than that. In fact, all told the White/Non-Hispanic portion of the Harvard student body is only 43.1%. So if you were sitting in a Harvard class and looked around, about six out of ten students would be non-White, and you'd think "Man, this place is really diverse. That is so cool!" Unfortunately, class isn't visible. If it were, and all students whose family made more than the national median income were green, you'd feel as if you were in an Astroturf factory. Everywhere you look, green green green. So while Harvard's students are phenotypically different, they have in common two things, as Michaels notes: "very high SAT scores, and, not coincidentally...wealth." To my mind, this sort of undermines the claim for diversity at Harvard, even though it has a student population with races represented roughly according to their proportions in the US in general, and is the 40th-ranked university in the US for diversity. Nine out of ten of the students all share the same economic background, the same experiences of American society, the same privileges. Now, it could be that at the graduate level in theatre programs this trend is totally reversed because of the emphasis on talent, and to some extent this is probably true, but not enough to reverse the overall trend: there is probably a good amount of racial diversity, but a pretty above average group economically. This is why, at meetings like the one I attended at Arena Stage, there is a reluctance to include a discussion of class as part of diversity, because all of a sudden most of the room turns green, which kind of takes all the wind out of the conversation. During the Harlem Renaissance, W. E. B. DuBois rested his efforts to affect racial equality on what he called the Talented Tenth -- the elite of the African-American community. Today, Harvard culls its student body from exactly this group. This is the problem with the Big 7. Graduate schools have a tendency to draw their students from a pool that got their undergraduate degrees from similar elite schools. If you look at the well-known contemporary playwights who are old enough to have gone to school when playwriting graduate programs were becoming well-known (born after, bsay, after 1960 or so), you'll notice something that they have in common: most went to elite prep schools or high schools in wealthy suburbs, and/or they went to private elite undergraduate schools. Doesn't matter what their race. Several of them come from families of modest means, others come from wealthier backgrounds, but one thing they have in common is that they spent their young adult lives among the privileged. And that just isn't diverse. It's something we don't like to acknowledge, because we like to think it is all about talent. But the road into the profession is pretty narrow, and follows a pretty specific path. * By comparison, at the University of Michigan or University of Illinois, both public institutions, 40% of the families of students make over $100,000 -- about half as much as Harvard, but still pretty wealthy compared to the US population in general. College is increasingly a middle-class and wealthy activity. To become a USA Fellow, one must be nominated. Each year nominations are made by a different anonymous group of arts leaders, critics, scholars, and artists chosen by USA. Nominators do not know one another; their identities remain confidential. Nominated artists are notified of their nominations and encouraged to apply. Artists are required to fill out a simple online application and submit work samples. Discipline-specific peer panels composed of leading artists and art experts meet to select the program finalists. The USA Board of Directors approves the final recommendations. No, seriously, those peer review panelists (from where? Gee, I wonder) are doing a great job acknowledging the whole USA -- you know, the USA that's in the title of the grants. Those are just the blogs that have leapt to my attention, but I know there are many others addressing these issues as well. If you know of some, please put their URLs in the comments. In his excellent book The Path of Least Resistance: Learning to Become the Creative force in Your Own Life, author Robert Fritz explains that human beings, like water, will naturally follow the path of least resistance, and that the only way to change the path of a river is to change the direction of the riverbed. In other words, people and by extension systems have underlying structures that control and the activities that occur within them. Winston Churchill described the same phenomenon when he said, "We shape our buildings and afterwards our buildings shape us." Once we create walls and ceilings and doors, certain paths are created and others are prohibited. Marx wrote about base and superstructure -- same idea. This isn't new. Buckminster Fuller, whose words serve as a motto on this blog, used this ideato c mraft a process of change. "Reform the environment, stop trying to reform the people," he wrote. "They will reform themselves if the environment is right." I was reminded of this idea while I was participating in the Arena Stage's convening last weekend devoted to "Defining Diversity." We spent a great deal of time telling our stories (extremely valuable -- see my previous post "The Diversity of E Pluribus Unum"), and talking about how "they," the people in charge, must change their attitude. Our understandable tendency was to focus on reforming people, instead of reshaping the environment, remolding the river's bed, changing the base. One reaction to this piece of information might be boredom. For instance, Matt Freeman's "From the "Knock Me Over With a Feather" Department" begins "This is not some big shock, right?" And Matt is right: every young theatre artist I talk too seems to see these programs -- in playwriting, yes, but acting, directing, and designing have their own only slightly different version of this Big Seven -- as their ticket to The Profession. However, I rarely hear them talk about wanting to study with a particular teacher, but rather the focus is almost always on "making connections," on "having doors opened." In other words, they are willing to pay tens of thousands of dollars in tuition as, basically, a bribe for access. Everyone smiles grimly and nods -- yes, that is Just the Way It Is. And while careerist cynicism may be the attitude du jour, all it takes is one step back to see how this one single "system" is tangled with so many other issues to which we all object and that we all wish to see changed. One of these is diversity. And one aspect of diversity -- the aspect that Americans do their best to ignore, even people who are concerned with diversity -- is class. This post is about the intersection of Class Avenue and Education Street. Take a look at that TDF list again: Columbia University, Yale University, New York University, University of Texas at Austin, University of Iowa, Brown University, and Julliard. Five of those schools are very expensive private schools -- they ain't called "elite" for nothing. The ramifications of this fact should be obvious: the people who go there will either be from wealthy families who can pay their way, or alternately will be people who go deeply into debt in order to attend. While there are some who will be foolish enough to undertake such a debt load, the reality is that it is primarily the children of the upper or upper-middle classes who are in a position to even consider going to such schools. Not to put too fine a point on it, but this is a class issue. It is the last wrung in a series of systemic ladders that privilege the wealthy at the expense of the lower classes, but that we disingenuously portray as a meritocracy. It begins in high school. If you are fortunate enough to grow up in a wealthy suburb, you are likely to have the benefit of a Drama teacher (or two) at your school and a well-financed and active drama program where you can begin to develop your talents and gain experience in front of an audience. If your parents are wealthy enough, they will notice your theatrical interests and send you off to drama summer camps for further arts training, and perhaps they will pull whatever strings are necessary to get you enrolled in a high school of performing arts, where you will receive more attention, more training, and more experience. The teachers in these programs, being savvy promoters of their students who understand how the system works, will be certain to take their most gifted students to college admissions auditions at places like the North Carolina Theatre Conference, where they will be courted by universities from across the region all waving wonderful scholarship oppotunities. The best of that group of high school students, the ones who combine a certain innate talent and drive with a great deal of buffing and preparation from their teachers, will be courted by elite Ivy League universities. There they will continue to experience all the benefits that money can buy. If, as Malcolm Gladwell writes in the highly recommended Outliers: The Story of Success, there is a 10,000 hour rule, which says that it takes 10,000 hours of practice to become a master of any discipline, then the scion of a wealthy family who has followed the path described above, who will not have had to work a part time job during his college years to make ends meet and so will have been able to focus entirely on theatre, will be well along in his or her quest for 10,000 hours of practice. Their classes will have been smaller than those at a large public university, and so they will have received the benefit of individual attention from their highly-paid professors. Contrast this with another young person who, like his or her wealthy counterpart, has the early stirrings of an interest in theatre. But this person lives in a rural area, or in the inner city, where tight budgets are the rule of the day and there is no drama teacher at all. If there is money to produce a play or two during the course of the year, it is directed by the overworked English teacher and produced on a shoestring in the school gymnasium. This teacher does her best to help this young, talented person, but she has no theatre training, and she has no idea that there are college admissions auditions for theatre, and if she does know it, she has no idea how best to help her student prepare for them. Summers, instead of going off to drama camp, this young person works 30 hours a week at the Wal-Mart to make money to go to college, if he or she is fortunate. This person will likely apply only to public universities that are close to home, regardless of the quality of the Drama Dept, because his parents, who didn't go to college themselves believe they can't afford the price tag of a private school, and besides their son has to live at home to save the cost of room and board. While in college (or community college), he must work 20 hours a week to pay for living expenses, which limits the number of shows he can do. Compared to his wealthy counterpart, he is far behind in the race to 10,000 hours. Furthermore, he hasn't really received much personal attention from his professors, because heisn't around the department very much because of his work schedule. After graduation, both students set off for the Big City to gain some professional experience. The wealthy student arrives with no student loan debt and living expenses provided by parents; the poor student gets a full-time day job to pay the rent, food, and make student loan repayments. The wealthy student is in a position to take an poorly paid that internship at a prominant regional theatre, where he meets many successful professionals who are impressed with his talent and motivation. The poor student attends as many open auditions as he can without missing so much work that he loses his job, and he lands a gig or two in storefront productions done on a shoestring budget and that go unrearked in the local press. After three years, both decide they would benefit from graduate school, and they apply to the Big Seven. The professors there look over their resumes. They look at the welathy student's materials and they see the glowing letter of recommendation from the associate artistic director at the regional theatre where the student interned -- the associate artistic director that one faculty member worked with a few years ago and who went to the same graduate school as the department chair. They also see the experiences at "prestigious" schools and conservatories, and they see the long list of projects that the student participated in. Then they look at the materials of the poor student, whose letters of recommendation are from someone they don't know at a school they have never heard of, and they look at the few obscure projects the poor student did over the past three years. And who do you suppose they choose? Based, of course, an an objective evaluation of their demonstrated talent and potential? Gee, I wonder. So now our wealthy student is part of a Big Seven MFA program, and his tuition is paid for by mom and dad, who are proud of their son's talent and progress, and the professors there are well-connected and happy to introduce their talented young protege to people who can help them out. And soon his play receives a reading at the regional theatre where he interned a few years ago, and thanks to a connection from a professor his next play receives a production on the second stage. And pretty soon, lo and behold, he is the Hot New Thing. And when we discuss his career, we focus on his talent and hard work, and maybe his luck. And we turn a blind eye to all the benefits he's had as a privileged member of our society, because we all know that theatre is about innate talent and desire, not anything as grubby as class or opportunity. And then a study comes out that hints just a wee bit at tip of the iceberg that is this "system," and theatre people all over the country yawn, shrug, and casually remark that that's Just the Way It Is, and there's probably something about talent underneath it all anyway. Democracy is built on a multiplicity of voices -- E Pluribus Unum, right? From the many, one. That motto is the description of a process: unification that develops through the consideration and integration of many viewpoints. And it never ends -- there are always new voices to consider, because times change and new people are either born, arrive from elsewhere, or begin to speak -- so the unum is always temporary, contingent, a circle. There are people who believe we ought to just be happy with the pluribus -- "you believe what you want, I'll believe what I want, let's just not talk about it" -- a concept of social balkanization, intellectual separatism. This is becoming easier in our mass media world where we can create a gated intellectual community with the touch of a computer filter button. But a functional democracy is built on constant friction. If you look at the way that "Angels in America" Part 2 ends, it is with a conversation between a straight Mormon woman, a gay Jewish man, a gay Protestant man, and an gay African-American man. They are talking about Perestroika in Russia, not directly about diversity, not about sexuality, not about religion (although all of these things are or very easily could be brought into the conversation). Rather, they are talking about something happening in the world that they see through different lenses. They are a diverse group sharing ideas, which gives those ideas dimensionality, depth. Because we have two eyes, we are able to perceive depth, because each eye perceives the same object from a slightly different viewpoint. The world seen through only one eye, from only one viewpoint, is flattened. On the other hand, think of how deep an object might look if we each had dozens of eyes. But we don't; we have two. So the best way to attain depth, to add dimensionality, is by seeing the world through the aggregated eyes of diverse people who discuss what they've seen. A play gives us a view of the world as seen through the playwright's two eyes. That view of the world is passed on to the theatre artists who transform the text from two dimensional words on a page to four dimensional embodied experience -- a production. In the process, they add many more eyes to the worldview, and so add depth. This four-dimensional embodied experience (the production) is then observed by those who are in the audience, who add even more eyes, more experience, more dimensionality. Thus, depth is added to the work not to the extent that it is unified, but to the extent that it is diverse. The more diversity at each stage of the process, the richer the artistic experience becomes. That's the pluribus part; where theatre falls down is in the unum. Unum results from the sharing of diverse viewpoints, so that each individual experience of the production is informed by the aggregated viewpoints of the group. Anyone who has ever posted a controversial idea on a blog ought to recognize the truth of this instinctively. Our ideas acquire complexity and depth to the extent that they are informed by the comments of those who read them and either disagree or agree while adding on. But our current model of theatre skips this process entirely. People are allowed into the theatre thirty minutes prior to the show, are plunged into darkness during the show so that they cannot see each other, are told to shut up while the show is in progress so that they cannot share their observations, and then they are hustled out of the theatre as soon as the show is over so they cannot share their viewpoints with anyone other than the people they came in with (and usually not with them, either). In other words, we miss the greatest opportunity for our productions to resonate most powerfully: dialogue, discussion, diversity. With apologies to Hegel, the play is the thesis, the spectator's experience is the antithesis, and then we skip the synthesis, the unum, entirely and thus short-circuit entirely the dialectic process that leads to progress, to understanding. We all of us, artists and spectators alike, are allowed to remain within our personal comfort zones and are not asked to incorporate the viewpoints of anyone else. At the "Defining Diversity" convening at Arena Stage last weekend, the second day was spent doing what in educational circles is known as "fishbowling." A subset of the participants were asked to sit at a central table to discuss a specific topic, and the rest of the group sat in a circle surrounding the table listening to the conversation. That's theatre, right? The group at the table talked and the other listened. The members of the outside circle were not allowed to interject, nor were the people at the table allowed to engage with those in the outside circle. However, that wasn't the end of it. After a topic was finished being discussed, there were breakout sessions where everyone was remixed into groups to further discuss what was said at the table. It wasn't a Q & A session where the members of the outside circle asked the table people what they meant, which in the theatre world is the equivalent of the traditional post-show discussion where the actors (the table people) are questioned by a handful of audience members (the outside circle). No, everybody talked to each other as equals, sharing our ideas, our reactions, our perspectives. And from those discussions can emerge an unum, a temporary understanding that comes from having many voices heard. We weren't all in agreement after the breakouts -- unum doesn't mean unanimity; but we all had been unified through shared experience. There was a closeness created, a relatedness, a unity, a collective respect. And as discussion followed discussion, that respect deepened. There are some who say that we, the artists and the spectators, are afraid of diversity, because we dislike being asked to confront aspects of reality with which we are uncomfortable. I disagree. In my opinion, what makes people avoid diversity is an understanding borne of experience that they will be confronted with a viewpoint that makes them uncomfortable or with which they disagree, one that often will portray them as villains, and then they will not be allowed to share their experience or response with anyone -- not the other spectators, and certainly not with the artists. They will have been shocked, accused, disrespected, and then silenced. Theatre today takes a sit-down-and-shut-up approach to the audience. Artists are hostile to the audience, fear them, disrespect them. I can't tell you how many times over the weekend I heard disparaging references to the "blue hairs" in the audience, as if age somehow made them less human, less aware, less intelligent. This is the American youth culture at its ugliest, one that dismisses the wisdom of age as irrelevant. But if we took the time to discuss a play with these spectators, we would soon come to another conclusion, and their insights and observations would enrich our understanding of the play and of our society. Age, after all, is a kind of diversity. There was a great deal of hand-wringing over the weekend about how we could get a more diverse audience, a more diverse company of artists, a more diverse season. Many solutions were offered, many of which would benefit the theatre if implemented. To these solutions, I would add one that is easily done, and that would lay the groundwork for greater diversity through a greater sense of understanding: build into each production a discussion. Let people talk to each other as a part of the play. Not as something that happens after the lights are turned on, but as a part of the play. Stop the play and ask the audience a question, and then have them turn in their seats and discuss amongst themselves for five minutes. Make sure they talk to people they don't know, not just those they came with. At the very least, put this before the curtain call, so it isn't an add-on, but an expected part of the show. Big regional theatres with a ton of space ought to then make a room, or part of the lobby, available after the show for those who want to talk about the play. Get facilitators to help stimulate the conversation. Let people talk to each other. Focus not only on the pluribus, but on actively, consciously, intentionally facilitating the creation of unum. Back on November 30, Isaac made a "Quick Announcement" that he would be attending an Arena Stage "convening" on the topic "Defining Diversity." He writes, "I, along with a few other bloggers, have been invited to attend and participate as well as "cover" the conference for this blog. I suppose you could call this is a "blog junket"..." It turns out that I, too, will be at the convening, as I have been asked to appear on the panel of twenty that is to discuss this topic. I was flattered to be asked, and look forward to a intriguing couple days this Friday and Saturday. For those who are interested, Arena Stage will be livestreaming the proceedings at 8:00 this Saturday night. And you can participate by sending questions through Twitter at #newplay that night. I'm looking forward to meeting Isaac and the other bloggers -- there are plans for an Ethiopian meal! When you're stepping outside the well-trodden path and trying to create something new, you often have to find inspiration outside of the discipline itself. I tend to read books on local economics, environmentalism, and small business practices seeking analogous situations that might help to define this new pathway. 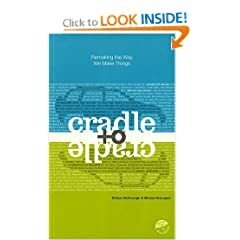 To that end, I am in the midst of reading Cradle to Cradle: Remaking the Way We Make Things, by William McDonough and Michael Braungart (highly recommended). The chapter "A Question of Design" has a segment entitled "One Size Fits All," in which the authors discuss the Industrial Revolution's underlying design assumption that "universal design solutions" (i.e., one size fits all) could be implemented to improve the world. They use the examples of International Style architecture and mass-produced detergent to illustrate the flaw in this orientation. I think it is worth quoting at length in order to fully understand that what has happened to the arts is not an isolated and unique historical development that was "organic" and "natural," but rather part of a larger social movement resulting of a particular way of relating to the world. unencumbered by distinctions of wealth or class. Large sheets of glass, steel, and concrete and cheap transportation powered by fossil fuels, gave engineers and architects the tools for realizing this style anywhere in the world. 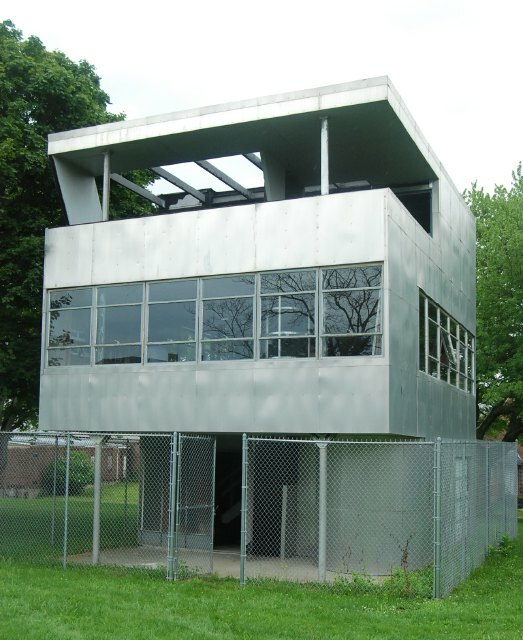 The photo is of the Aluminaire House, and it is, without a doubt, one of the ugliest things I've ever seen. Major soap manufacturers design one detergent for all parts of the United States or Europe, even though water qualities and community needs differ. For example, customers in places with soft water, like the Northwest, need only small amounts of detergent. Those where the water is hard, like the Southwest, need more. But detergents are designed so they will alther up, remove dirt, and kill germs efficiently the same way anywhere in the world -- in hard, soft, urban, or spring water, in water that flows into fish-filled streams and water channeled to sewage treatment plants." In the interest of appealing to as large a market as possible, detergent is disconnected from its relationship to local conditions. The arts have fallen prey to exactly the same one-size-fits-all approach, not only in mass-produced art such as television, popular music, and movies, but also in art forms that have an intrinsic local orientation, such as theatre and visual art. Plays, for instance, are designed to appeal to NYC audiences and critics. If they achieve a successful NYC run, then across the US regional theatres will produce their own versions during the next couple years, and twenty years later community theatres will do their own reproduction. But is it really true that the stories and styles that appeal to a New York audience will automatically be right for one in Asheville, NC or Lincoln, NE? Would these two places not lead, for instance, to very different paintings -- paintings that would be created using different palettes, different shapes, different rhythms, different styles, different brushstrokes, different techniques? And yet when it comes to plays, we see plays such as Rent being performed in Peoria and witnessed by the ultimate New Yorker, Rocco Landesman, who will judge it according to New York values. We universalize those values, and disseminate New York stories as if, like the International Style architecture and mass-produced detergent, they are completely isolated from place, from local culure, traditions, history, and values. People in New Amery WI watch CSI: New York despite the fact that it bears no resemblance whatsoever to their reality. We have become so alienated from our specific place in the world that we no longer even notice that we have been colonized by urban values, urban rhythms, urban styles, urban stories. The gangsta rap music blasting from the car next to mine in downtown Marshall NC is likely to be owned by a farmer's son out on a Saturday night toot. The natural outgrowth of this colonization is for the colonizer to see themselves as the pinnacle of quality, as the natural goal of all who labor in the arts. So nobody bats an eye when Rocco Landesman, visiting Peoria and seeing the aforementioned production of Rent, is noted as having observed "earlier in the day that amateur arts are worthwhile much in the same way that minor leagues and amateur sports have value in relation to the big leagues and professional sports." There is no recognition that local arts done by amateurs or pro-am artists might not give a tinker's damn about the self-identified "big leagues," that the local arts might be a vibrant end in themselves. And artists buy into this value system. Why? Because they are brainwashed with the ideas from a young age. More importantly, what should be commented on is not whether the Peoria production of Rent is "as good as" Steppenwolf ("I'm not going to let you trap me on that one," Landesman said transparently -- har har), but rather whether it makes any sense for Rent to be performed in Peoria at all. When are areas outside of New York going to develop some pride, some sense of individual identity? When are they going to express themselves, instead of compulsively sneezing "Me too" after every artistic twitch on the East Coast? When is a visit to the theatre in different parts of the country going to be a unique experience, seasoned with local flavor and served with pride of place? When traveling, every tourist seeks an opportunity to experience the local cuisine, whether it is barbecue in Kansas City, gumbo in New Orleans, or kringle in Racine WI. But going to the theatre is like going to the mall -- once you're inside the doors, you could be anywhere. University theatre programs need to stop teaching this generic approach, regional theatres need to reclaim their local roots, and artists need to wake up and reclaim their individuality. I just returned from a quick trip to Illinois to see my stepson, Jake Olbert, perform in Illinois State University's production of Into the Woods. It was a very strong production, marred only by a small amount of directorial tinkering. After the performance Friday night, the show, which was an Associate entry in the American College Theatre Festival, received a "response" from an ACTF rep from a school down the road. I, myself, have been an ACTF Respondent many times over the course of my career, and had many of my shows adjudicated as well. It isn't an easy job. You see the show, take some quick notes in the dark as the show goes on, and ten minutes after the curtain comes down you face the assembled cast, crew, designers, and director to share your thoughts about the production. No time for thought of reflection. It is made even more difficult by the attitude ACTF takes toward the response. I’m here representing the Kennedy Center American College Theatre Festival and I’m charged to respond to the performance I just experienced. I was not a part of the process that helped bring the play life, and I cannot comment on your growth in the work during that process but I can respond to what I just experienced as an informed member of the audience with a certain amount of training and experience as an artist and a teacher. I am not the art police, the oracle of theatre or the supreme authority on how this play works best in performance. Hopefully some of the things I’m about to say will resonate with the very fine training you are already receiving, and if so, please take my words to heart as the gifted and insightful comments of a remarkably astute theatre professional. On the other hand, if I say something you don’t agree with or you hear something that doesn’t resonate with what you’ve been hearing all through rehearsals, for heaven’s sake dismiss my remarks as the lunatic ravings of a sadly misguided schmuck with no discernable taste whatsoever. No matter what we say here in this session, you should in no way alter the choices that you and your director have so carefully built. You can imagine the kind of mealy-mouthed responses that result from this approach to critique. It is the adult version of the undergraduate belief, trotted out whenever the issue of quality arises, that "what is good and bad is subjective." But if that is the case, then why do college departments pay $250 plus travel, lodging, and food to bring in someone from another university to provide feedback? After all, if he or she is "just one person," just an "informed member of the audience" and not, God forbid, an expert, then why not simply choose an audience member at random to stay after the show and give their impressions. I guarantee that they would at least be forthright, which is more than can be said about ACTF respondents. What is ironic is that students, who know they are supposedly being prepared to go out, like lambs to the slaughter, into a profession with 87% unemployment, are hungry to hear an honest appraisal of their work. They want to hear what they did well, yes, but they also want to hear what they could have done better, because they want to have a chance when they graduate. Instead, what they get are airy generalities and gentle ego massages. It is a terrible disservice. The response to Into the Woods followed this pattern to the letter. Everything and everybody, one at a time, was "wonderful," and the highest point of praise was that nothing happened that "took me out of the play." Consider the altitude of that particular bar: "you didn't do anything that took me out of the play." That this is worthy of notice, indeed that it serves as high praise, is an indication of the general level of college productions; that it is considered a critical insight is an indication of the general level of critical thinking by college theatre professors. I wish I could say that the level of discourse when the faculty talk amongst themselves is considerably higher -- informed by broad knowledge, deep experience, and careful reflection. But I can't. We lack a common vocabulary, much less a common set of critical values. Most college professors, especially if they have been "trained" in an MFA program as most have, have spent their graduate education focused on the development of their own creative abilities -- period. They have spent 90% of their time doing plays, doing scenes, designing sets or costumes, cranking out production after production. They are never required to read broadly, develop critical thinking skills, clearly describe what they do, analyze their own work (both before and after it is done), develop a vocabulary and the skills that would allow them to learn from the work of others, see productions by masters, expose themselves to other art forms, or gain a knowledge of the world that would be deep enough to interpret a play by Kushner, Goethe, Shakespeare, Aeschylus, or whoever. What they are required to do...is plays. And then, when they do, they don't receive high level feedback. Compare this to, say, college sports. A college football player or basketball player spends a lot of time doing, just like a theatre major, but the feedback they get is specific, demanding, and highly critical. Their performances are put under a microscope in the newspaper or on television after every game by experts, and fans don't hesitate to express their feelings about their work at the stadium, on the newspaper blogs, and in restaurants. If a coach comes in from another school to watch practice, that coach is likely to be brutally honest, because that's why he was brought in -- to improve the team. Most importantly, the coaches will share a common vocabulary and set of values that allow real communication to take place. Compared to sports, the level of discourse in theatre departments across the country, even the most so-called prestigious, is woefully backward. It isn't only, as Tom Loughlin writes in his brutally frank discussion of "The Artist / Educator Gap," that theatre education provides students with "a skill set that is rapidly becoming outmoded and does not give young artists the tools they need to continue being artists," although that is bad enough, but that even these outmoded skills are being poorly taught by people who haven't taken the time to really understand what they are doing. All they've done is put on plays. That many of these professors have the temerity to include these productions on their annual reports as "scholarship or creative activity" shows a total lack of understanding of what scholarship really is. Scholarship involves joining an ongoing conversation, making a new and original contribution, having that contribution reviewed by qualified peers, and making those findings public. If theatre teachers at the college level held themselves to the same standards as other disciplines, and felt they were responsible for making each production a contribution to the field, and felt responsible to communicate their findings to the field -- well, maybe American theatre programs wouldn't be so amateurish, and as a result maybe the American theatre scene wouldn't be so relentless superficial and inept. And maybe artists wouldn't be so resentful of their college professors. (All one needs to do is play the song "Nothing" from A Chorus Line in front of a group of actors to understand the full extent of the residual anger.) The fact is that the students know instinctively that they have been ripped off, that their professors are more concerned with their own egos than with helping them grow as artists and human beings (yes, those things are equally important), and that they have been either coddled through four years of college (and three years of grad school), or arbitrarily abused by unreflective egotists who haven't the faintest idea what they are doing but nevertheless do it loudly and with bone-jarring force. The theatre is probably second only to opera in the complexity of the demands it makes on its artists. It deserves a professoriat worthy of those demands. Wow. "These pieces offer insights....into the way artists and producers think -- a rare intimacy." If McNulty is right, the "rareness" of this intimacy is a 25 year condemnation of artists and producers within the American theatre. Simply making art isn't enough. It is the responsibility of the artist to speak about the work, to write about the work, to contribute insights to the development of the field. The largely trivial nature of the last 25 years of theatre stands as a testament to the lack of ideas and the lack of communication. To those who think that rude, ad hominem attacks are worthwhile, I suggest you keep them on your own blogs. On this blog, they will no longer be approved. Period. Next topic of conversation. Over at A Poor Player, Tom Loughlin has written an excellent post entitled "A Question of Quality," in which he worries about his increasing crankiness with the general level of mediocrity he sees in theatre -- mediocrity that insists it be treated as excellence. What troubles Tom, and is of particular interest on for those of you following the development of the CRADLE(arts) philosophy, is how the issue of "quality" plays out within a commitment to participatory arts. What "keeps me from fully embracing a retreat from the concept of the “professional artist,” Tom writes, "is my fear that, given the propensity of 21st century society to raise the mediocre to the level of excellence, there will soon be no excellence at all." He goes on: "The question of quality is one that I think is tiptoed around when we speak about participatory arts. When we work to open the arts to all (an idea I fully support), in this current cultural mindset we run the risk of reducing the quality of art. When everyone can get a hamburger from McDonald’s, they begin to think that McDonald’s makes a pretty good hamburger. We know that dedication, full-time commitment, experience, and an intense passion for excellence can create high quality, and that is what we have traditionally meant by “professional artist.” Trying to ascertain what is the best process and best practices we can put into place to increase participatory arts while at the same time maintaining high quality will be the trickiest part of the entire enterprise." The issue of quality is one that has plagued arts criticism for millenia: what makes something "good"? What if one critic "likes" something and another doesn't -- doesn't that mean that the concept of quality is "all subjective"? What if one era dismisses something, but a later era loves it -- or vice versa? When the term "quality" is introduced into the participatory arts / community-based arts discussion, it is usually used as a way to suggest that amatuer artists don't (indeed, can't) c reate work with a "quality" as high as that made by a professional whose "dedication, full-time commitment, experience, and... intense passion for excellence" gives them a greater likelihood of achieving excellence. Indeed, in Malcolm Gladwell's wonderful book Outliers, he devotes most of an entire chapter to the "10,000 hour rule," which says that, no matter what it is, you have to do it for 10,000 hours before you are truly able to make a lasting contribution. The most memorable example he gives is The Beatles, whom Gladwell argues benefitted from the 8-hours-a-day gigs required of them when they were playing in clubs in Hamburg. It's a persuasive argument. On the other hand, Charles Leadbeater and Paul Miller make an equally persuasive argument in The Pro-Am Revolution. They write: "From astronomy to activism, from surfing to saving lives, Pro-Ams - people pursuing amateur activities to professional standards - are an increasingly important part of our society and economy. For Pro-Ams, leisure is not passive consumerism but active and participatory, it involves the deployment of publicly accredited knowledge and skills, often built up over a long career, which has involved sacrifices and frustrations." However, I think virtuosity is only one part of "quality," and perhaps not the most important one. Virtuosity is something that is contained within the artist, and expressed through the work of art. It stands alone. For me, however, quality is an interaction, it is something that is created between an work of art and its audience. A work of art can exhibit virtuosity, but fail to connect to its audience in any way. For example, a concert pianist might be a virtuoso playing a Mozart concerto, but if he performs before an audience for whom the Western tonal system is foreign and meaningless, then for me the performance lacks "quality." On the other hand, a story told by someone who lacks virtuosity, but whose story connects to its audience in a powerful, immediate way, for me, is a higher "quality" performance. In other words, "quality" exists not in the work of art or performance itself, but in the experience of the art by a specific audience. Which brings me to what I consider more important than virtuosity: authenticity or genuineness. The characteristic of being "free from pretense, affectation, or hypocrisy; sincere:; or "Honestly felt or experienced: genuine devotion." This is a characteristic that exists both within the artist and the audience. The works is genuinely felt by the artist and authentically experienced by the audience. To me, more than anything else, this is what leads to a "high quality" performance -- the authentic communication of a genuine emotion or idea from artist to audience. Sometimes, authenticity is enhanced by virtuosity -- for instance, think of when you watch figure skating in the Winter Olympics and you have been informed how difficult a particular move is and how long the skater has been working on it. When that skater successfully executes that move, you as an audience share in his or her authentic emotion and you appreciate the sheer virtuosity of what was accomplished. But all too often, virtuosity becomes an end in itself, and it stands between the audience and the epxerience. The form has taken precedence over the content, and the result is an empty experience and a lower "quality" experience for the audience. For example, much modernist art is incomprehensible to the average spectator, and while it may exhibit a high level of virtuosity, the experience is one of bafflement. Would that experience be improved by a degree of knowledge, so that one might appreciate the technique? Absolutely, and such knowledge might release the authentic emotion contained within the virtuosity. But again, that rests not in the virtuosity itself, but in the interaction between audience and work of art. Which in turn means that the "quality" of a work of art changed with each audience. Like Tom, I find most theatre that I see mediocre at best. But for me, it isn't because it lacks virtuosity, but rather that it lacks genuineness -- I don't believe it, I don't feel it. It doesn't speak to me, because I have no connection to the artist, the story he or she tells has little connection to my life, and all the virtuosity in the world won't bridge that gap. Obviously, the ideal is to combine virtuosity and authenticity. The question is which element is primary. For me, a work of art needs to first be authentic; virtuosity is frosting on the cake.